Dr. Abdel-Khalik joined the Georgia Tech faculty as the Georgia Power Distinguished Professor in 1987. He was appointed to his current position as the Southern Nuclear Distinguished Professor in 1993. He served as Associate Director of the Woodruff School of Mechanical Engineering between 1990 and 1992 and as the Georgia Tech Secretary of the Faculty between 2002 and 2006. He served as a member of the USNRC Advisory Committee on Reactor Safeguards (ACRS) between 2006 and 2012, including two years as Chairman (2009-2011). Prior to joining the Georgia Tech faculty, Dr. Abdel-Khalik served as a faculty member in the Nuclear Engineering and Engineering Physics Department (1976-1987) and as a Postdoctoral Fellow in Chemical Engineering (1973-1975) at the University of Wisconsin-Madison. Dr. Abdel-Khalik also served as a Senior Engineer at Babcock and Wilcox Nuclear Power Generation Division (1975); as a Guest Research Scientist at the Nuclear Research Center in Karlsruhe, Germany (1979); and as an Invited Professor at EPFL, Lausanne, Switzerland (1982). Over the past forty years, Dr. Abdel-Khalik’s research has covered a wide range of areas in both nuclear and mechanical engineering; including reactor operations and safety, reactor engineering and thermal-hydraulics, accident and transient analysis, two-phase flow and heat transfer, cooling of ultra-high power density systems; first wall protection and cooling of high power lasers for inertial fusion applications; microscale heat transfer, and vapor explosions. 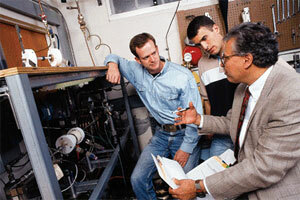 Dr. Abdel-Khalik has supervised over 110 graduate theses in both mechanical and nuclear engineering. His research has resulted in nearly 400 papers and publications in leading journals and conference proceedings as well as several patents. His research is funded by both Government agencies and industry, including the US Department of Energy, Oak Ridge National Laboratory, and Southern Nuclear Operating Company. “A Nuclear Reactor Control System," US Patent No. 5,045,275 (September 3, 1991). A Film Pump for Applying a Monolayer Film over Water Surfaces” (with M. T. Pauken and S. M. Jeter); US Patent No. 5,558,845 (September 24, 1996). “Electrode Arrangement for Electrohydrodynamic Enhancement of Heat and Mass Transfer,” (with S. M. Jeter); US Patent No. 6,374,909 (April 23, 2002). “Solid Particle Receiver with Porous Structure for Flow Regulation and Enhancement of Heat Transfer,” US 2013/0068217A1 dated 03/21/2013 (with H. Al-Ansary, et al.). Dr. Abdel-Khalik currently serves as a member of the External Advisory Boards for the School of Nuclear Engineering at Purdue University and the Mechanical Engineering Department of King Saud University in Riyadh, Saudi Arabia. He also serves as a member of the Board of Trustees for Badr University in Cairo, Egypt. “A statistical analysis of saturated nucleate boiling along a heated wire,” International Journal of Heat and Mass Transfer, 26, 509-519, 1983 (with D. D. Paul).